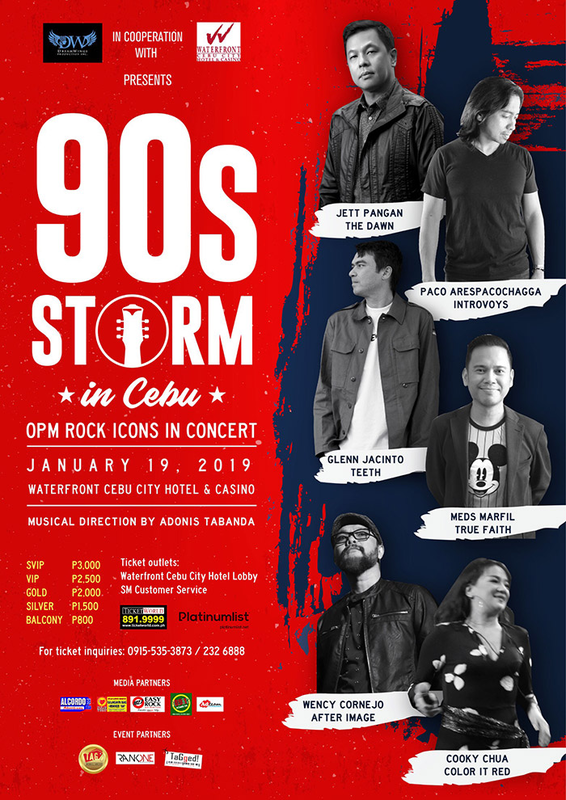 If you're planning to enjoy your weekend to the Sinulog Festival in Cebu, the OPM rock icons of the 90s will be joining together in one concert at the Queen City dubbed '90s Storm in Cebu on January 19, 2019, at the Pacific Grand Ballroom at Waterfront Hotel and Casino. Jam with Jett Pangan of the Dawn, Paco Arespacochagga of Introvoys, and Glenn Jacinto of Teeth. To complete your 90s hits, joining are Meds Marfil of True Faith, Wency Cornejo of After Image and Cooky Chua of Color It Red. It's going to be more exciting this weekend at the Sinulog Festival as your favorite 90s OPM icons will set in one venue. Tickets can be sold at the Waterfront Cebu City Hotel lobby and SM Customer Service.